Delicious looking and sounding! I love the flavor of malt. Malted milk remind me of my childhood and malt shakes and Woolworths. Yea! So glad to read your tips about malted milk powder. I just bought a big container for the malted milk ball cake I made and was wondering what the heck I was going to do with the rest of it. Also, I can't believe I have never made madeleines at home. I blame it on not having the pans but that's hardly a good excuse. These look and sound terrific. Good job on achieving that perfect little bump! Love these! I've always wanted a madeleine pan but always figured I'd never use it. I think you convinced me to give it a go! Can you believe I've never made madeleiner before? Gotta change, gotta change: these look delicious! Very beautiful! I need to bake some too! the marvelous pumpkin section this fall! Love that top photo - really good. And these look terrific! I haven't tasted malted milk for years, but now I'm craving something made with it! Really nice post - thank you. Those Baked books are so good. 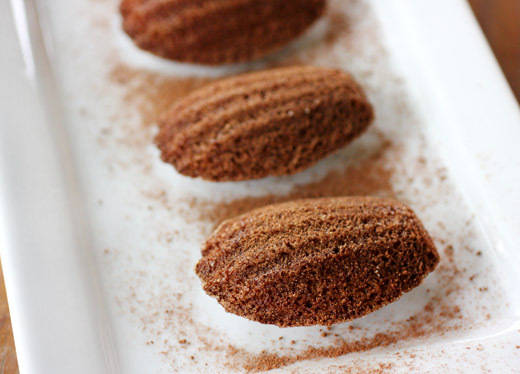 The madeleines are a great treat with coffee. i've always loved the look of madeleines--they're so dainty and elegant! Yes, there is a difference. Milk powder is just dried milk. But, malted milk powder has malted barley, wheat flour, and dried milk. Hope you can find it to try some! 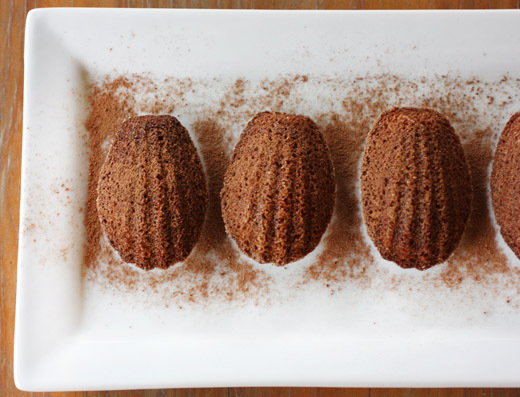 Your madeleines are pure perfection! Mine never have such gorgeous definition...I need to break out my pans and give your chocolate version a shot! Looks so mouth-watering!! I need madeleine moulds, where can I get it? They're non-stick and work great. I just made the banana bread with peanut butter - so good!! I've only made madeleines once and they came out terribly so I've been scared off. I think I need a better pan. My mom used to make malteds for us when I was a kid so I love anything with that flavor. Madeleines! I have the silicone baking sheet, and the deep desire to make some, but so far Iam a madeleine virgin..
Wow Lisa, your madeleines look so pretty, delicate and flavorful. Beautiful pictures! 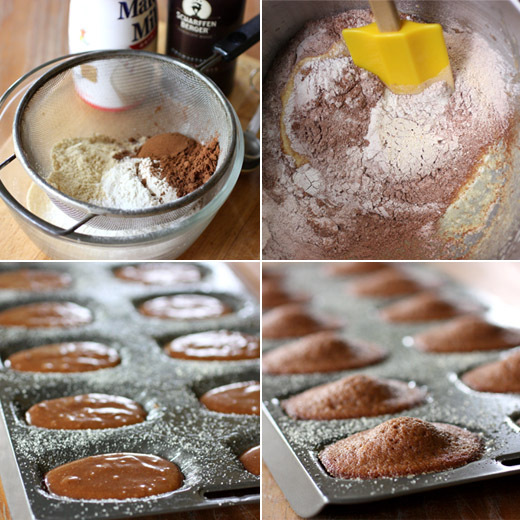 gorgeous madeleines and great tip about substituting cocoa powder partially with malted milk powder in baking. Beautiful medeleines! I love the malted milk idea. It reminds of being a kid. These would be so pretty for a ladies brunch. I love malt flavored shakes and ice creams, but I've never baked with it. Sounds so good! I've had my eye on this cookbook. I have their one just before this one and love it! Very well executed Lisa - I would love to try those. Such a pretty presentation too! This book has been on my list forever! The malted milk twist is such a great idea. I bought this book a couple of days ago and cannot wait for it to arrive! Your madeleines look so pretty, Lisa! Absolutely perfect. I'm not sure how I found you but so glad I have! This - and other recipes I've glanced at - looks fantastic. And your photos are totally gorgeous. Will be returning.